I will bombard you all with pictures when i get home - so for now please welcome Suzanne to the Weeekly Challenge. 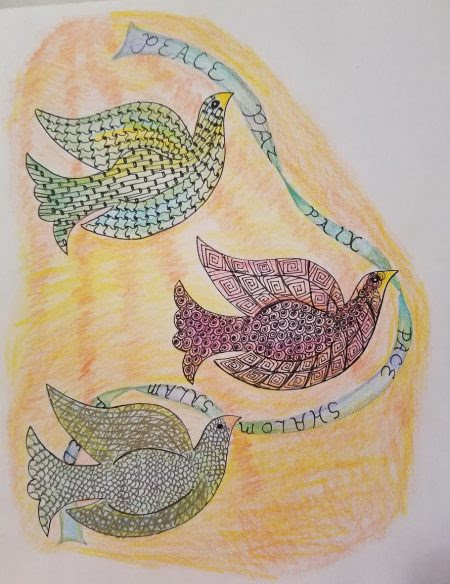 Weekly Challenge #275: "Guest Post: Give Peace a Chance - Suzanne Fluhr, CZT"
During her boys' summer holidays, Laura Harms, needs a break from her Zentangle Diva schedule. (After all, even Diva's need a break from Divadom sometimes.) I volunteered to supply a guest Diva post. I'm writing this on the day after the nightmare in Dallas, Texas, when at the end of a peaceful Black Lives Matter rally in response to two more seemingly unwarranted police killings of black men, a murderous gunman armed with an assault rifle, targeted the police, killing five officers and wounding 7 other police and civilians. If you don't live in the United States, you're probably wondering, "What the [bleep] is going on there?" I'm an American of a certain age. I have an opinion about what is going on here, but I'll write about that elsewhere. Meanwhile, I'm just so sad about the violence and the polarizing hatreds in American society and, indeed, throughout the world. I'm old enough to remember 1968, the year that saw the assassinations of the Reverend Martin Luther King, Jr. and Robert F. Kennedy and the race riots in American cities, including my hometown, Philadelphia. The war in Vietnam was raging. In 1969, John Lennon recorded "Give Peace a Chance". In 1980, he joined the list of those assassinated in the United States. For this week's challenge, I'd like you to dedicate yourselves to expressing "Give Peace a Chance" through art, using Zentangle and Zentangle Inspired Art techniques. Despite a dominant hand tendon sprain which I'm supposed to be resting, I couldn't rest tonight. (I'm writing this at 4:30 a.m. and haven't been to bed yet.) I've done three compositions, trying to express my yearning for peace. The first is a Zendala, incorporating the "peace sign". 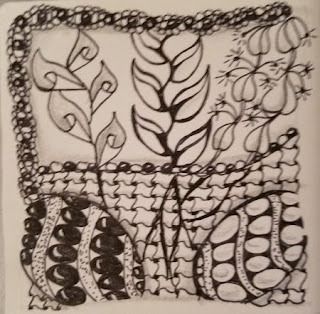 Tangles used starting with outside border: My own, Phirst, Paradox, Tripoli and Patena. Tangles used: Purk an official tangle by Maria Thomas, Euca by Anna Marks, Akoya by Sandy Hunter, Cadent (another official tangle from the Mother Ship), and Eddyper by Damy from Taiwan. I admit I slipped another "A" tangle in there, my own Linda Farmer sanctioned, Aloha. I look forward to seeing your responses to this challenge. 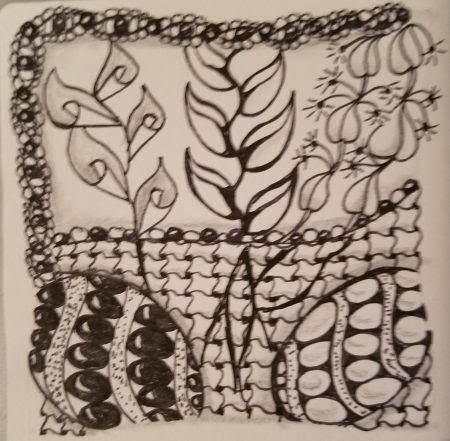 And if you're on the Zentangle Mosaic App, - i'm @iamthediva - come on by and follow me, and i'm going to be using hashtags on the app for each of my weekly challenges. So if you're game use the hashtag #DC275 (Diva Challenge #275) for your tile this week! You can also search in the app for people's contributions to the challenge by clicking on the hashtag from inside the app, or using the search function. Lovely post and very timely challenge - let's all think about Peace and the good that IS out there as well! Thanks Suzanne for this important post and thanks Laura for making it into your challenge. Let's try to be peaceful in our little lives and spread it around our worlds. good challenge...I really need this today. Thanks! thank you so much for this theme this week! Timely challenge, too bad we can't challenge everyone to Give Peace a Chance. Thanks Suzanne. Thank you Suzanne for making time to write this post and give us this challenge. I think you're missing a line segment between the two downward angled lines. Love your choice of patterns and colors none the less!!! I just posted this on the Yorkshire Tortoise blog. 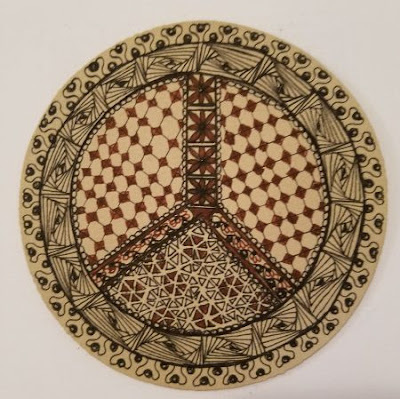 I think it is interesting enough that others might like to know where the Peace Sign came from: "Now this is weird, but I didn't even notice the missing leg on anyone's tile. LOL I wanted to make sure I got it right (why I couldn't remember I don't know. I was in the middle of all that in the late 60's early 70's), so I checked it. I found out that this little symbol is actually from 1958 during the Anti-nuclear demonstrations in Britain. The arms symbolize the use of a semaphore (flags used to create letters to spell out words). The 2 legs are at a 45 degree angle from the center and symbolize one letter and the straight up and down symbolize the flags being held up and down. I don't remember which is which, but one is for N the other for D meaning Nuclear Disarmament. http://www.crwflags.com/fotw/flags/qt-p-nd.html Here's a link to the explanation." I have loved seeing what others have done with this challenge. It took me awhile and some research, but I came up with some good tangles. Thank you Suzanne, for presenting this challenge. Great challenge and well timed! Thank you for the challenge Suzanne and I hope you are enjoying your holiday Laura! Apparently, the need for PEACE in this world is all the push I needed to participate, for the very first time, in a Diva's Challenge. Suzanne, thank you VERY much for your well-written post. I do believe that if more people were to focus on the essentialness of peace, we just might be able to make it happen. Yes first time for me too..Something that is on all our minds I feel, peace.